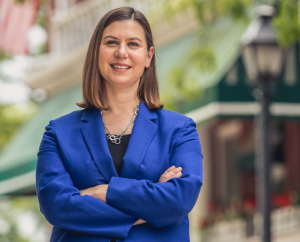 Rep. Elissa Slotkin is a third-generation Michigander who has spent her career in national service, serving three tours in Iraq alongside the military, and working as a national security expert for both Democratic and Republican administrations. Elissa lives in Holly, Michigan, on her family farm; her great-grandfather arrived on Ellis Island and achieved the American Dream by founding the family meat business, Hygrade Foods. Elissa’s mom died of ovarian cancer in 2011 after struggling for years to get coverage due to her pre-existing condition, and Elissa ultimately decided to enter the congressional race after she saw her opponent Rep. Mike Bishop celebrating in the Rose Garden following his vote to repeal the Affordable Care Act. Elissa successfully flipped this district in 2018 and is fighting to preserve the American Dream in the 8th district and across the country as an advocate for the issues Bend the Arc Jewish Action cares most about. In Congress, she is serving on the House Armed Services Committee and the Committee on Homeland Security.